All proceeds go to design of a paved bike-walk connection from Mattapoisett to Marion. There is a time-sensitive funding gap. Your support will help us get a state grant and keep designers working towards a Town Meeting vote. We have a tremendous Matching Challenge Offer. Two generous donors will, together, match dollar-for-dollar, the first $35,000 of donations toward our goal of $100,000. The project to pave 1/2 mile of rutted dirt road will make car-free biking and walking easy between Mattapoisett and Marion as early as 2021. It will enhance quality of life for all ages. 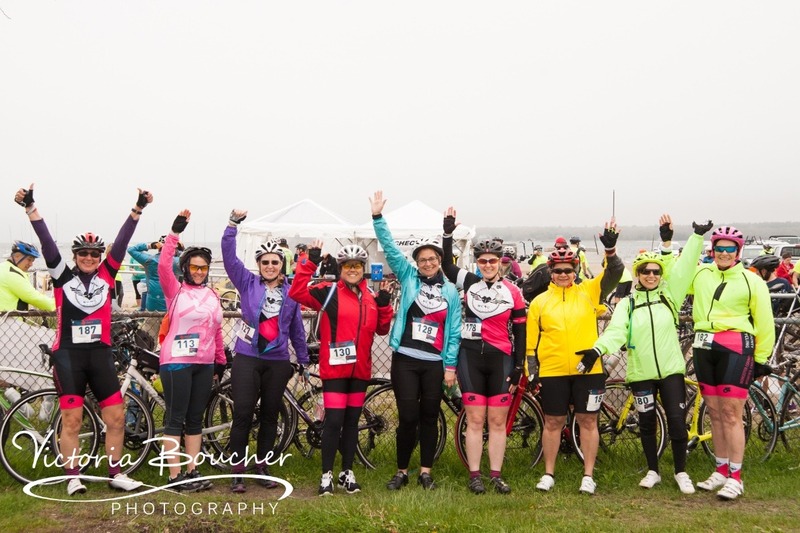 Imagine: for long distance cyclists, riding on busy shoulderless roads like Route 6 or 105 will be history: The 1/2 mile enables a low- traffic/ no- traffic route between Wareham, Marion, Mattapoisett, Fairhaven and New Bedford. 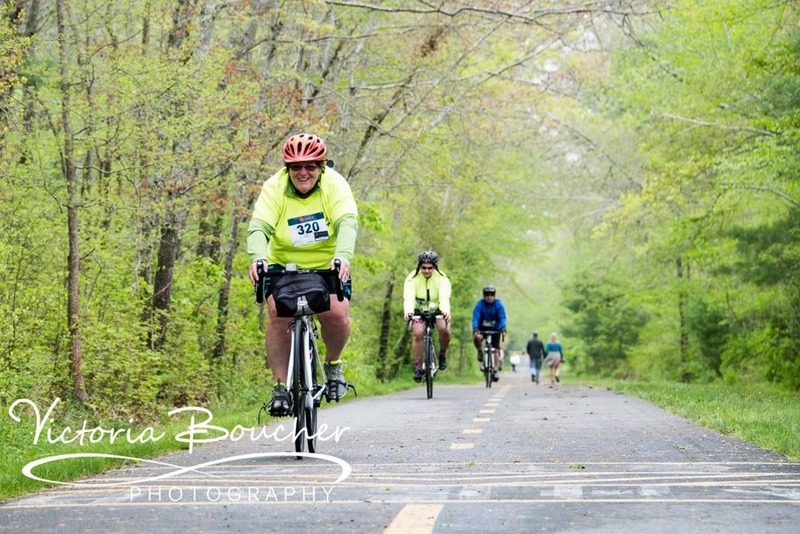 Beginning in 1998, Mattapoisett, Massachusetts began working to build a bike path –actually a rail trail– along the shore of Buzzards Bay in Southeastern Massachusetts. The project is a total 4.5 miles in length but due to environmental and right of way issues it is being built in 4 segments of approximately 1-1/4 mile each. What's next: We anticipate 2019 is the year the second segment (yellow) will be built. I call this the "Shining Tides Mile:" Massachusetts Department of Transportation will oversee construction which should begin in March, 2019. The low bidder and presumed contractor is D.W. White Construction of Acushnet. We love the local connection! The final segments are denoted in Blue and Red shown above. Our next priority, aiming for 2020, is the Marion Connector because, when this 1/2 mile is complete and connected to the Marion Pathway (Magenta, 2021), there will be a paved bike route (using North Street sidewalk and low traffic roads) allowing riders to go between Fairhaven and Marion without going on Routes 6 or 105. We are currently raising funds for design of a segment from Industrial Drive to Marion Town Line. Our fundraiser is to pave one 1/2 mile in the woods, currently a rutted gravel service road. There is other work planned, but that is separate and part of a larger project to completely upgrade Industrial Drive. Paving the 1/2 mile is a game changer for local and regional bikers and walkers. There will be car-free biking and from Industrial Drive to Brewfish. There will be easy access to trails in that area. There will be a mostly car-free route from Fort Pheonix, Fairhaven to Point Road, Marion. There will be a route from Fort Taber, New Bedford to Main Street Wareham featuring safe crossings of route 6 and no need to ride on Route 6 and 105. There will be an on road interim route to connect Depot Street to Industrial Drive. Marion Pathway Project has MassDOT construction funding scheduled for 2021. Our project will not use DOT TIP funding because for us, first availability will be 2024. Instead, we are writing a Department of Conservation and Recreation (DCR) MassTrails grant (due February 1) to meet Marion's schedule. We are writing a Doppelt Family Grant (Due January 31). Our Municipal Project Manager will help us seek out other state grants to make the length of Industrial Drive car free as well. There are many factors which make this an attractive project for state funding, but private funds have a role. Private donations in any amount received or pledged right now will be doubled by a generous donor. State grant money aimed at bike path projects is highly competitive. Town or private matching funds are a) necessary to be eligible for the grant b) helpful in indicating local support. Your help will allow us to write a letter of commitment. Also, this springs design activities will need to stop unless private funds can supplement the 10% design and project management funding already approved by the Town. Municipal funding has many constraints and uncertainties. A strong showing in private support for our MassTrails grant (Deadline January 31) may help put us very high in the rankings. And it will help when we must ask May Town Meeting for its own portion of the match ad for reimbursable grant funds. We will be looking to our base to donate right now so we can maximize the potential of the funds. 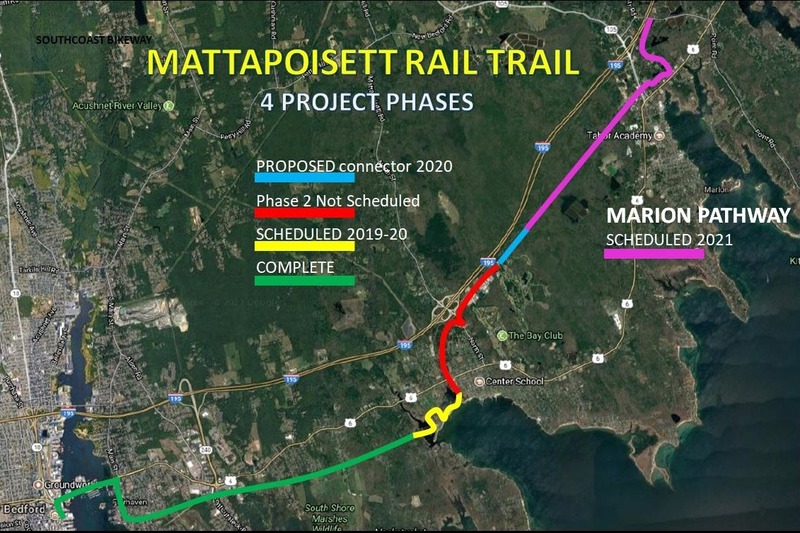 Our early estimate of construction costs for the Marion-Mattapoisett Connection is $446,000 . This includes design fees of $77,000 to be confirmed in the coming weeks. We have set our total goal at $100,000 in order help with costs for a safe crossing of North Street or trail ammenities. February is Budget and Schedule month with the selected project manager and designer. A full accounting of anticipated project costs will emerge from the 10% design process and before Town Meeting warrant is published. It's important to keep the whole project moving through each separate grant award process according to their timelines and Town and state fiscal funding schedules. 2018 Project scope expands to meet grant criteria. Grant submitted July, 2018. Your donation benefits the entire region and encourages the Town of Mattapoisett to continue building this and future bike paths.